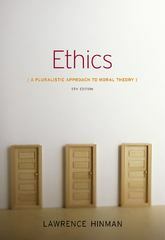 Ethics: A Pluralistic Approach to Moral Theory 5 Edition ETHICS: A PLURALISTIC APPROACH TO MORAL THEORY, FIFTH EDITION provides a comprehensive yet clear introduction to the main traditions in ethical thought, including virtue ethics, utilitarianism, and deontology. Additionally, the book presents a conceptual framework of ethical pluralism to help readers understand the relationship among various theories. Lawrence Hinman, one of the most respected and accomplished professionals in ethics and philosophy education today, presents a text that gives readers plentiful opportunities to explore ethical theory and their own responses to them, using fascinating features such as the "Ethical Inventory" sections that appear at the beginning and the end of the text. End-of-chapter discussion questions, and the use of current issues and movies help students retain what they've learn and truly comprehend the subject matter.